Rain-soaked pavements. Flashbacks. The femme fatale. Hard-boiled dialogue. The doomed male protagonist. Shadows. Paranoia. The elements that define the style of Film Noir are so well-known to have been adapted, reworked and even parodied, the style itself being flexible enough to even survive the frenetic action-dominated new millennium with films such as Sin City and The Black Dahlia re-inventing the key aspects of its style for a new generation of filmgoers. In The Rough Guide To Film Noir, Alexander Ballinger and Danny Graydon present a highly accessible, informative and compact distillation of the whole milieu. After a section dealing with the origins of the Noir stylistic (which posits usual historical influences such as German Expressionism alongside the less often cited- but nonetheless essential- impact of other areas of cinematic heritage such as the Universal horror films of the early 1930s), the authors turn their attention to discussing the Noir films of the 1940s. In doing so, a fascinating momentary case is made for a film like Stranger On The Third Floor(1940) being the first true Noir film, although attention soon turns to that usually given an honorary place at the beginnings of the movement- The Maltese Falcon (1941). This section of the book presents a concise overview of the history of Noir from this moment through to 2006 using key examples alongside shaded text box overviews of sub-divisions to the whole term and the influence of historical developments on Film Noir itself. This overview gives way to the main part of the book- a detailed discussion of what are referred to as ‘The Canon: 50 Essential Film Noirs’- which involves the authors taking an alphabetical look at what they feel are the primary examples of the genre. Although the word genre is evoked occasionally throughout the book, it seems that the authors share my concerns with attempting to ‘pigeonhole’ Film Noir as a mere genre, for it does, as the authors note, straddle several distinct genres. Instead, it may be more helpful to refer to a visual style- this is, after all, the leading way in which we think of a Film Noir; the very look of the film making it different. Thus, whether old or new, monochrome or colour, the resultant list of 50 Noir films has this visual aspect very firmly in place. The only other point of debate here is whether a chronological ordering would have served the purpose better and highlighted the development of the stylistic. However, given the previous overview of Noir’s history (admittedly far shorter), some idea of the context has already been provided. It could be imagined that the use of such a comprehensive list as its backbone may cause the book to run out of steam thereafter. Not so. The following chapter alphabetically identifies key figures (‘the icons’) of Film Noir, whether they be directors, stars or even technicians. Only when the films they were involved in are placed beside their names can some credit be given- and this rightly seems to underpin this whole chapter: there are those who do not only guest at the Film Noir motel but have residency there, such is the overwhelming influence they have. After this acknowledgment of people, the book moves on to acknowledge place- and offers a useful compendium of cities linked to some Noir movies that were filmed there, usefully cross-referenced to the main entries earlier. As if proof that Film Noir can not be considered merely a genre per se, the next chapter in Ballinger and Graydon’s book discusses its impact on other genres. Insightfully observing Noir elements in a disparate variety of genres (from animation to comedy, science fiction to the western) the authors prove their initial contention that ‘the noir label has been applied to other genres…apart from crime dramas’ (p.4). This whole chapter does more than this however, for it highlights the sheer influence of Film Noir and (ironically) reflects in doing so on the lower artistic status initially given to the style by critics and industry alike. In essence, this chapter calls for a re-assessment of the stylistic elements of Film Noir- we should not think of these as inhabiting purely a world of crime and deception but of having strands that permeate other genres and styles of filmmaking too. This convincing implicit argument is extended in the following chapter which takes a look at ‘International Noir’ and shines the spotlight not only on those familiar countries to adopt elements of Noir (like Great Britain and Italy) but includes Latin America and even Russia in its sweep across the globe, showing that the visual stylistic of Film Noir was not strictly limited to a specific time period nor even a specific country, but was imbued into many films worldwide. Time constraints do not permit a more detailed examination of key international films in the Noir style which is a pity- Visconti’s sizzling adaptation of James M. Cain’s novel The Postman Always Rings Twice deserves more space than it can be allocated, the same going for Melville’s stylish French films of the 1950s, 1960s and 1970s. The final chapter of The Rough Guide To Film Noir is devoted to the spread of the term across other forms of media- television, magazines, books, websites, festivals and retailers of merchandise. This provides a succinct conclusion and draws together differing strands of Film Noir from across several inter-linked areas. Attempting to précis such a monumental film style as Film Noir into approximately 300 pages is no mean task, but Alexander Ballinger and Danny Graydon manage to do it. The major successes of The Rough Guide To Film Noir are threefold- it presents a lively yet informative text; covers a vast area yet always tightly manages its content; and suffuses itself with as much appreciation and respect for the films and their creators as the films themselves are suffused with paranoia and mistrust. Overall, the book achieves a difficult balance of the academic and the accessible- and, unlike in a Film Noir, this male reader emerged at the end in a far better state than in which he started. 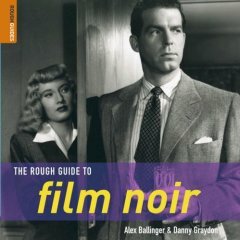 'The Rough Guide To Film Noir' is published in the 'Rough Guides' series.